This tutorial trains a Transformer model to translate Portuguese to English. This is an advanced example that assumes knowledge of text generation and attention. The core idea behind the Transformer model is self-attention—the ability to attend to different positions of the input sequence to compute a representation of that sequence. Transformer creates stacks of self-attention layers and is explained below in the sections Scaled dot product attention and Multi-head attention. It make no assumptions about the temporal/spatial relationships across the data. This is ideal for processing a set of objects (for example, StarCraft units). Layer outputs can be calculated in parallel, instead of a series like an RNN. Distant items can affect each other's output without passing through many RNN-steps, or convolution layers (see Scene Memory Transformer for example). It can learn long-range dependencies. This is a challenge in many sequence tasks. For a time-series, the output for a time-step is calculated from the entire history instead of only the inputs and current hidden-state. This may be less efficient. If the input does have a temporal/spatial relationship, like text, some positional encoding must be added or the model will effectively see a bag of words. After training the model in this notebook, you will be able to input a Portuguese sentence and return the English translation. Use TFDS to load the Portugese-English translation dataset from the TED Talks Open Translation Project. This dataset contains approximately 50000 training examples, 1100 validation examples, and 2000 test examples. Create a custom subwords tokenizer from the training dataset. The original string: Transformer is awesome. The tokenizer encodes the string by breaking it into subwords if the word is not in its dictionary. Add a start and end token to the input and target. Note: To keep this example small and relatively fast, drop examples with a length of over 40 tokens. Operations inside .map() run in graph mode and receive a graph tensor that do not have a numpy attribute. The tokenizer expects a string or Unicode symbol to encode it into integers. Hence, you need to run the encoding inside a tf.py_function, which receives an eager tensor having a numpy attribute that contains the string value. # cache the dataset to memory to get a speedup while reading from it. Since this model doesn't contain any recurrence or convolution, positional encoding is added to give the model some information about the relative position of the words in the sentence. The positional encoding vector is added to the embedding vector. Embeddings represent a token in a d-dimensional space where tokens with similar meaning will be closer to each other. But the embeddings do not encode the relative position of words in a sentence. So after adding the positional encoding, words will be closer to each other based on the similarity of their meaning and their position in the sentence, in the d-dimensional space. Mask all the pad tokens in the batch of sequence. It ensures that the model does not treat padding as the input. The mask indicates where pad value 0 is present: it outputs a 1 at those locations, and a 0 otherwise. # to the attention logits. The look-ahead mask is used to mask the future tokens in a sequence. In other words, the mask indicates which entries should not be used. This means that to predict the third word, only the first and second word will be used. Similarly to predict the fourth word, only the first, second and the third word will be used and so on. The dot-product attention is scaled by a factor of square root of the depth. This is done because for large values of depth, the dot product grows large in magnitude pushing the softmax function where it has small gradients resulting in a very hard softmax. For example, consider that Q and K have a mean of 0 and variance of 1. Their matrix multiplication will have a mean of 0 and variance of dk. Hence, square root of dk is used for scaling (and not any other number) because the matmul of Q and K should have a mean of 0 and variance of 1, so that we get a gentler softmax. The mask is multiplied with -1e9 (close to negative infinity). This is done because the mask is summed with the scaled matrix multiplication of Q and K and is applied immediately before a softmax. The goal is to zero out these cells, and large negative inputs to softmax are near zero in the output. q, k, v must have matching leading dimensions. but it must be broadcastable for addition. to (..., seq_len_q, seq_len_k). Defaults to None. # add the mask to the scaled tensor. # add up to 1. As the softmax normalization is done on K, its values decide the amount of importance given to Q. The output represents the multiplication of the attention weights and the V (value) vector. This ensures that the words we want to focus on are kept as is and the irrelevant words are flushed out. # so the second `value` is returned. # so all associated values get averaged. # so their values get averaged. Pass all the queries together. Multi-head attention consists of four parts: * Linear layers and split into heads. 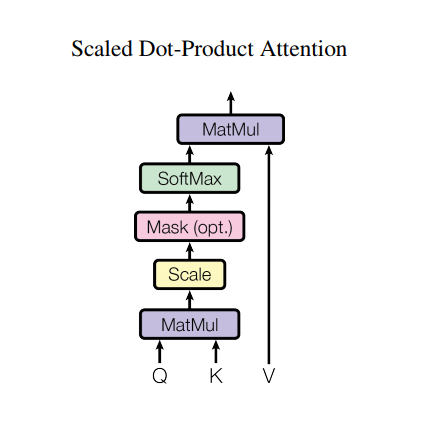 * Scaled dot-product attention. * Concatenation of heads. * Final linear layer. Each multi-head attention block gets three inputs; Q (query), K (key), V (value). These are put through linear (Dense) layers and split up into multiple heads. 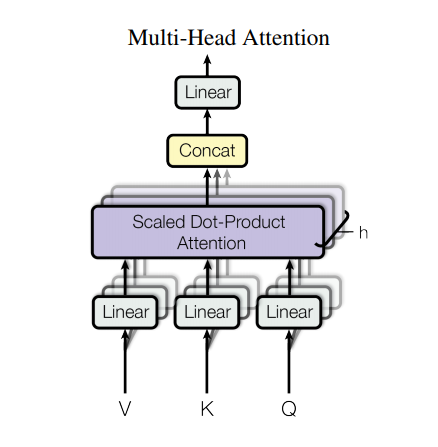 The scaled_dot_product_attention defined above is applied to each head (broadcasted for efficiency). An appropriate mask must be used in the attention step. The attention output for each head is then concatenated (using tf.transpose, and tf.reshape) and put through a final Dense layer. Instead of one single attention head, Q, K, and V are split into multiple heads because it allows the model to jointly attend to information at different positions from different representational spaces. After the split each head has a reduced dimensionality, so the total computation cost is the same as a single head attention with full dimensionality. """Split the last dimension into (num_heads, depth). Create a MultiHeadAttention layer to try out. At each location in the sequence, y, the MultiHeadAttention runs all 8 attention heads across all other locations in the sequence, returning a new vector of the same length at each location. Point wise feed forward network consists of two fully-connected layers with a ReLU activation in between. The transformer model follows the same general pattern as a standard sequence to sequence with attention model. The input sentence is passed through N encoder layers that generates an output for each word/token in the sequence. The decoder attends on the encoder's output and its own input (self-attention) to predict the next word. Point wise feed forward networks. Each of these sublayers has a residual connection around it followed by a layer normalization. Residual connections help in avoiding the vanishing gradient problem in deep networks. The output of each sublayer is LayerNorm(x + Sublayer(x)). The normalization is done on the d_model (last) axis. There are N encoder layers in the transformer. Multi-head attention (with padding mask). V (value) and K (key) receive the encoder output as inputs. Q (query) receives the output from the masked multi-head attention sublayer. Each of these sublayers has a residual connection around it followed by a layer normalization. The output of each sublayer is LayerNorm(x + Sublayer(x)). The normalization is done on the d_model (last) axis. There are N decoder layers in the transformer. As Q receives the output from decoder's first attention block, and K receives the encoder output, the attention weights represent the importance given to the decoder's input based on the encoder's output. In other words, the decoder predicts the next word by looking at the encoder output and self-attending to its own output. See the demonstration above in the scaled dot product attention section. 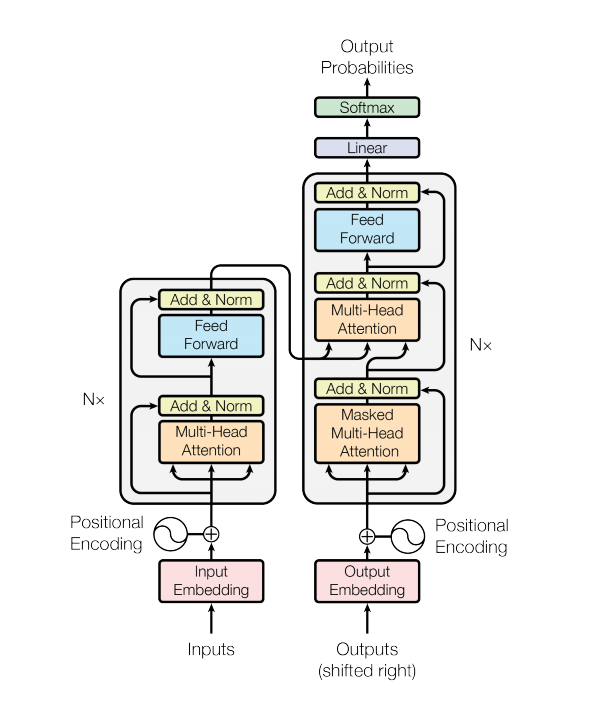 The input is put through an embedding which is summed with the positional encoding. The output of this summation is the input to the encoder layers. The output of the encoder is the input to the decoder. # adding embedding and position encoding. The target is put through an embedding which is summed with the positional encoding. The output of this summation is the input to the decoder layers. The output of the decoder is the input to the final linear layer. Transformer consists of the encoder, decoder and a final linear layer. The output of the decoder is the input to the linear layer and its output is returned. To keep this example small and relatively fast, the values for num_layers, d_model, and dff have been reduced. The values used in the base model of transformer were; num_layers=6, d_model = 512, dff = 2048. See the paper for all the other versions of the transformer. Note: By changing the values below, you can get the model that achieved state of the art on many tasks. Use the Adam optimizer with a custom learning rate scheduler according to the formula in the paper. Since the target sequences are padded, it is important to apply a padding mask when calculating the loss. # Used in the 2nd attention block in the decoder. # This padding mask is used to mask the encoder outputs. # Used in the 1st attention block in the decoder. Create the checkpoint path and the checkpoint manager. This will be used to save checkpoints every n epochs. # if a checkpoint exists, restore the latest checkpoint. The target is divided into tar_inp and tar_real. tar_inp is passed as an input to the decoder. tar_real is that same input shifted by 1: At each location in tar_input, tar_real contains the next token that should be predicted. For example, sentence = "SOS A lion in the jungle is sleeping EOS"
tar_inp = "SOS A lion in the jungle is sleeping"
tar_real = "A lion in the jungle is sleeping EOS"
The transformer is an auto-regressive model: it makes predictions one part at a time, and uses its output so far to decide what to do next. During training this example uses teacher-forcing (like in the text generation tutorial). Teacher forcing is passing the true output to the next time step regardless of what the model predicts at the current time step. As the transformer predicts each word, self-attention allows it to look at the previous words in the input sequence to better predict the next word. To prevent the model from peaking at the expected output the model uses a look-ahead mask. Portuguese is used as the input language and English is the target language. Encode the input sentence using the Portuguese tokenizer (tokenizer_pt). Moreover, add the start and end token so the input is equivalent to what the model is trained with. This is the encoder input. The decoder input is the start token == tokenizer_en.vocab_size. Calculate the padding masks and the look ahead masks. The decoder then outputs the predictions by looking at the encoder output and its own output (self-attention). Select the last word and calculate the argmax of that. Concatentate the predicted word to the decoder input as pass it to the decoder. In this approach, the decoder predicts the next word based on the previous words it predicted. Note: The model used here has less capacity to keep the example relatively faster so the predictions maybe less right. To reproduce the results in the paper, use the entire dataset and base transformer model or transformer XL, by changing the hyperparameters above. Input: este é um problema que temos que resolver. Predicted translation: this is a problem that we have to solve . Real translation: this is a problem we have to solve . Input: os meus vizinhos ouviram sobre esta ideia. Predicted translation: my neighbors heard about this idea . Real translation: and my neighboring homes heard about this idea . Input: vou então muito rapidamente partilhar convosco algumas histórias de algumas coisas mágicas que aconteceram. Predicted translation: so i 'm going to play with you some magic moments that happened , they have happening . Real translation: so i 'll just share with you some stories very quickly of some magical things that have happened . You can pass different layers and attention blocks of the decoder to the plot parameter. Input: este é o primeiro livro que eu fiz. Predicted translation: this is the first book that i did . Real translation: this is the first book i've ever done. In this tutorial, you learned about positional encoding, multi-head attention, the importance of masking and how to create a transformer. Try using a different dataset to train the transformer. You can also create the base transformer or transformer XL by changing the hyperparameters above. You can also use the layers defined here to create BERT and train state of the art models. Futhermore, you can implement beam search to get better predictions.